What do you want from a hotel? Great food, great service, comfortable beds and super showers. Then there are the little extras that make all the difference…Luxury skincare products, a proper coffee machine in your room, extra fluffy towels, White Company bed linen. 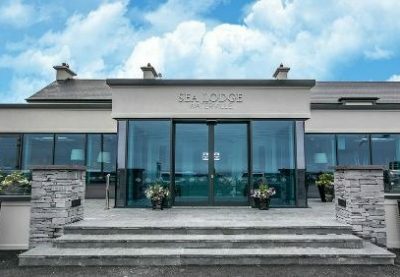 We’ve got all of that covered at Sea Lodge Waterville and of course it helps when you’re in one of the most beautiful places on earth; the stunning scenery of the Ring of Kerry is the backdrop to your stay. We’ve got world-class golf courses, majestic mountains, watersports, walking, gorgeous gardens, historic houses and a thriving social scene. Your stay can be as busy or as chilled out as you want. Whether it’s a family gathering, a celebration or a few days away from the hustle and bustle, the staff at Sea Lodge Waterville are waiting to welcome you with open arms. Featuring free WiFi throughout the property, the Sea Lodge Hotel offers 12 beautifully appointed ensuite bedrooms, each exquisitely designed by the team at Exhibit McCabe. The Lough Bar is where you can relax over a drink or enjoy great local food prepared by an award-winning kitchen team. Read a book, peruse the papers, catch up online or play some old-fashioned board games in the Library. Later on you can dance your socks off to live music or disco in the Legends Ballroom.